Illustrator McCauley “Mac” Conner, born in 1913 and still active today at the age of 101, continues to reside in New York City. He arrived during World War II and stayed on to forge his career at a time when the city served as the hub of a burgeoning publishing and advertising industry. From the late 1940s through the early 1960s, Conner enjoyed great success as an illustrator for advertisements and for fiction stories appearing in several women’s and general interest magazines. 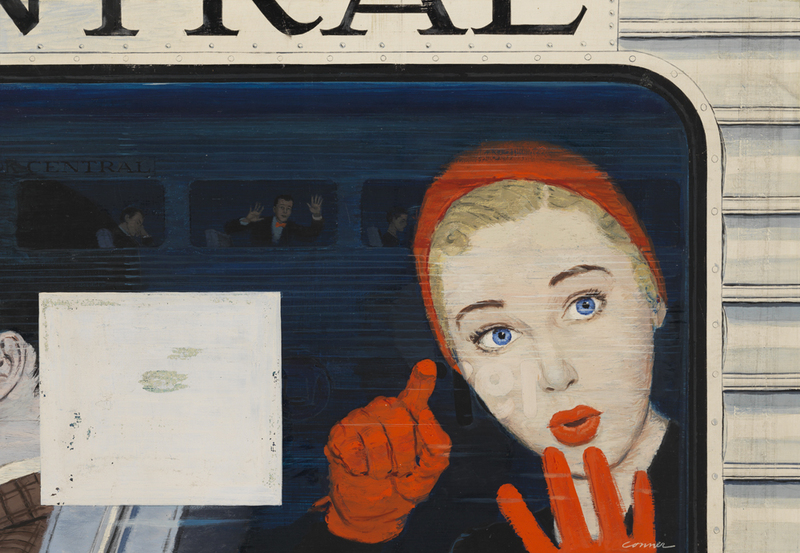 Mac Conner: A New York Life, on view at the City Museum through January 19, 2015, features over 70 never-before-exhibited original paintings and offers a window into this particular moment of New York City history. 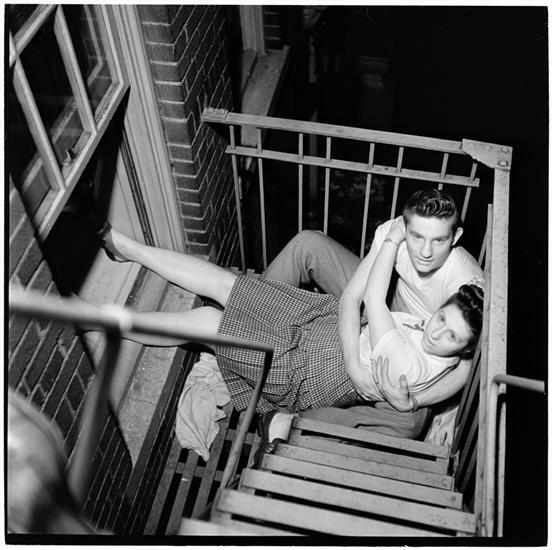 A similar sensibility informs the photographs of a young Stanley Kubrick, who worked in the same era as a staff photographer for LOOK magazine. 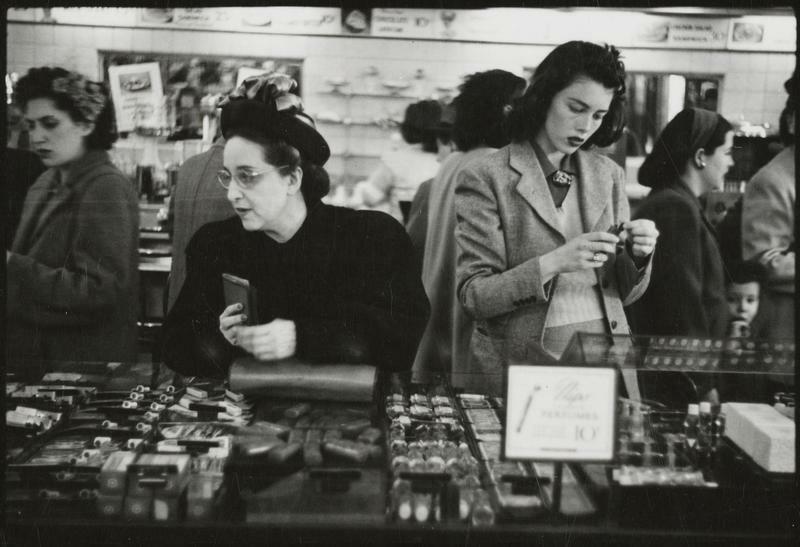 From 1945-1950, before gaining notoriety as a film director, Kubrick captured candid moments of everyday life on the streets of New York City. Both Conner and Kubrick were tasked with providing striking images that would grab the attention of readers, but they differed in their approaches and intent—in part because they provided imagery to distinct types of publications. Conner, like Kubrick, worked on assignment. 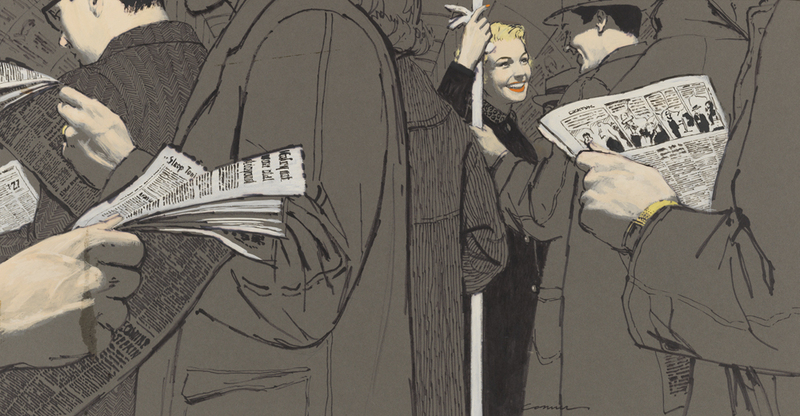 He was a mainstay illustrator for The Saturday Evening Post, Collier’s, and This Week Magazine—a newspaper supplement that at its height appeared in 42 papers nationwide and could have brought Conner an audience of as many as 13 million people. But much of his work accompanied stories published in leading women’s magazines, notably the group known as the “Seven Sisters” (McCall’s, Redbook, Ladies’ Home Journal, Better Homes & Gardens, Good Housekeeping, Family Circle, and Woman’s Day). Publications aimed at women were not new; indeed, Good Housekeeping and Ladies’ Home Journal were among those that debuted in the late 19th century. 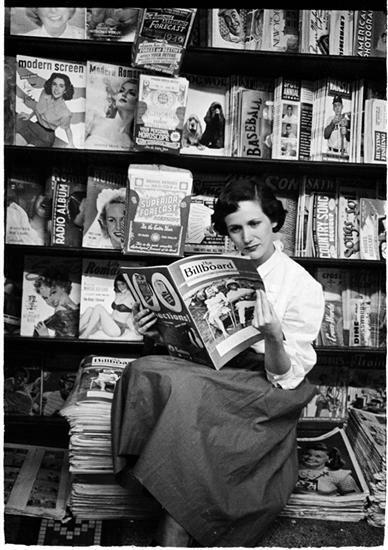 But the proliferation and success of these publications in the middle decades of the 20th century coincided with post-war affluence and an explosion in consumerism—and they provided a powerful boon to advertisers who recognized that women comprised a powerful class of consumers. Daily life inspired and informed Conner’s paintings, which illustrated incidents in fictional narratives. Kubrick found his actual subject in the everyday, generating images that would be published in one of the nation’s preeminent photojournalism publications. 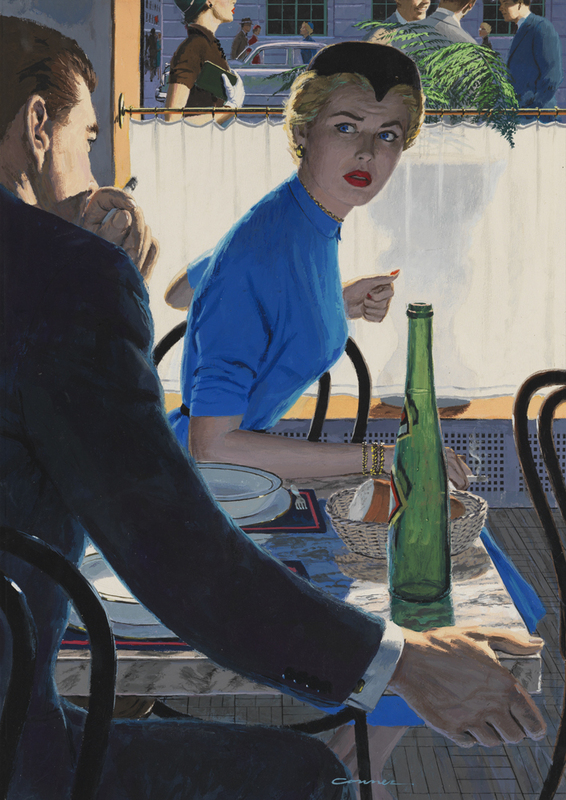 Conner’s paintings reflected cultural trends and mores, whereas LOOK magazine deliberately focused on topical political, social, and cultural issues. Kubrick’s photographs from the Museum’s collection, paired with Conner’s illustrations, provide perspective on the atmosphere and style of the times expressed by Conner’s imagery. Conner illustrated many stories that unfold in New York City, and his depictions both align with and depart from the reality that Kubrick’s photos convey. 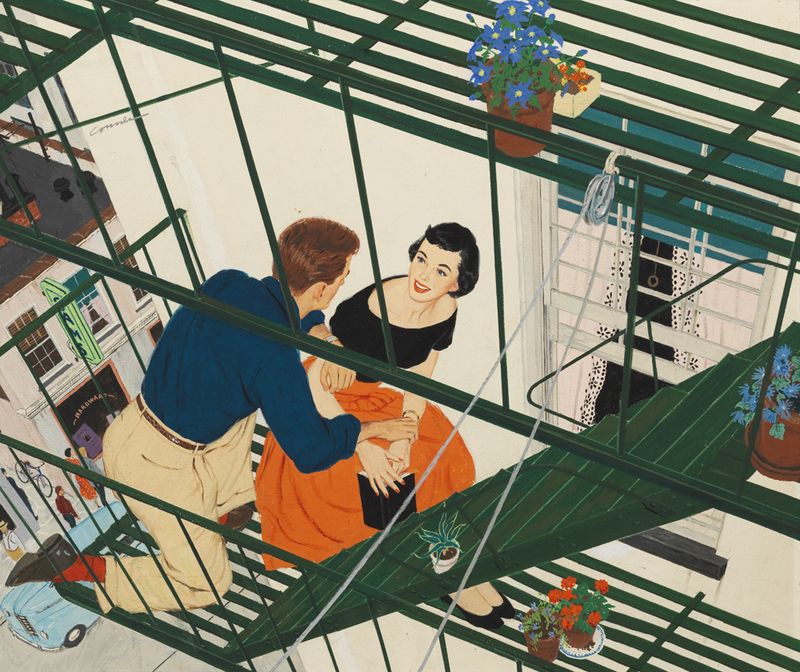 To situate the leading image of Arthur Gordon’s “Let’s Take a Trip Up the Nile,” published in This Week Magazine on November 5, 1950, Conner capitalized on the ubiquity of fire escapes—and the privacy they afforded young couples. Illustration for “Let’s Take a Trip Up the Nile” in This Week Magazine, November 5, 1950. Gouache and graphite on illustration board. Conner portrays an idealized, chaste couple in a carefully constructed scene that is likely based on actuality but modified to enhance the overall design. Kubrick explores similar formal devices, such as the perspective from above and the use of angular elements to create a visually interesting composition. But where Conner’s illustration permits the viewer to passively observe everyman and everywoman—in essence, offering a representative image of mid-century New York City—Kubrick’s lens interrupts and surprises two individuals, intrusively capturing a specific moment in time. The narrator of “The Girl Who Was Crazy About Jimmy Durante,” a story by Philip Gould that appeared in the September 1953 issue of Woman’s Day, shares Conner and Kubrick’s predilection for people-watching. Conner illustrated this story, and Kubrick’s photograph of the New York City subway reveals his real-life inspiration. and ink on illustration board. 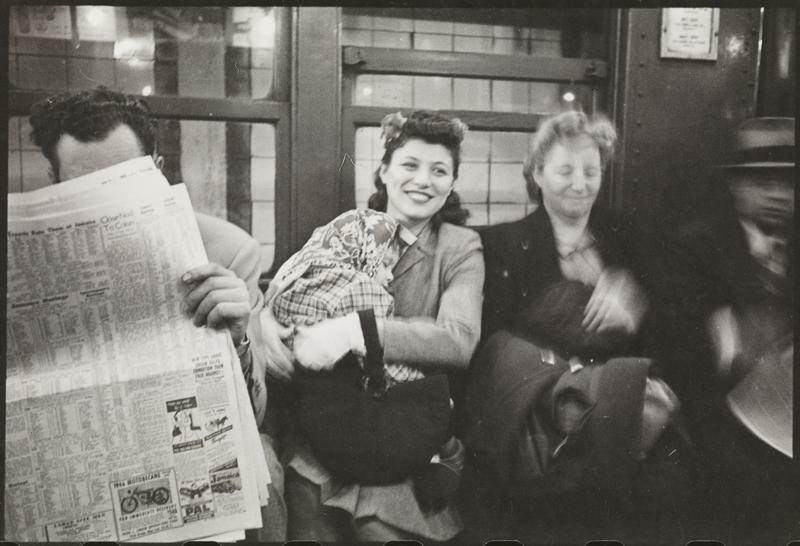 Across from Kubrick sits an attractive, smiling, well-dressed woman next to a man deeply engrossed in his newspaper. 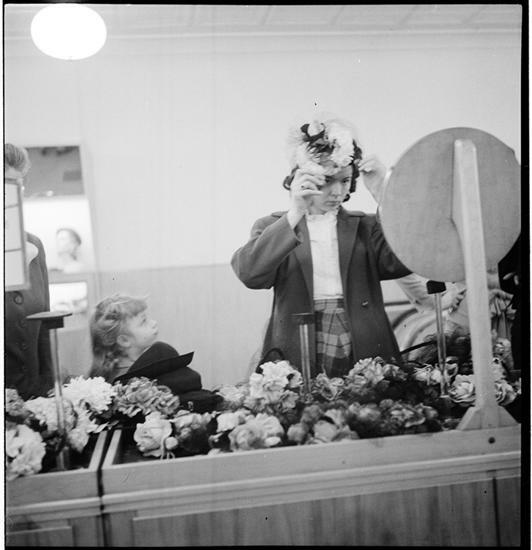 Each individual engages with an object or with a person outside the camera’s frame; none recognize the voyeuristic presence of the camera/viewer. Conner builds on these components, populating his invented train car with paper-reading gentlemen who convey a sense of quiet rush hour crowds and create a largely gray mass of color that fills most of the canvas. Conner enables the reader to adopt the protagonist’s point of view through this swath of gray-jacketed men and catch a glimpse of the vibrant young lady, fairly sparkling in their midst, who has so captured the narrator’s fancy. The story’s teller notes all of the details of the young lady’s dress—and how becoming they are to her—and speculates about the details of her life. 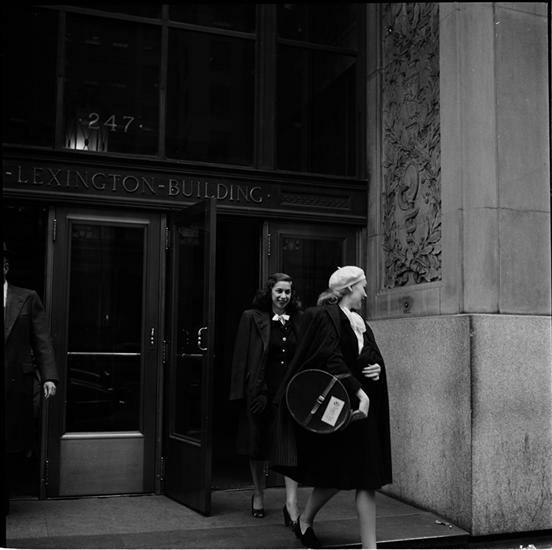 “She looked too young to be some big executive’s privileged private secretary,” he muses, concluding that she might work along Madison Avenue at one of the advertising agencies. “Have you ever walked along Madison Avenue at dusk?” he queries of the reader. “I wasn’t living in New York before I went in the Army, but I knew some New Yorkers then who used to get that faraway look in their eyes like the rest of us, and now I know what they were daydreaming about, where they wished they were. Madison Avenue at dusk, with all the pretty girls from all the offices and modeling agencies streaming out of the stately buildings on their way home. All the pretty young American girls, still fresh and bright after a long day, their hair shining, their clothes just right.” Kubrick immortalized a transient moment such as the narrator describes: two well-heeled young ladies leaving a large office building on 34th Street, two blocks off Madison. Like the girls the narrator describes, the women in Conner’s illustrations are impeccably dressed, icons of contemporary style. He based these details in part on simple observation, but he also cites the influence of his agent’s wife, Jessie Neeley, who kept him informed of changing trends in glove lengths, hairstyles, and the cuts of dresses. 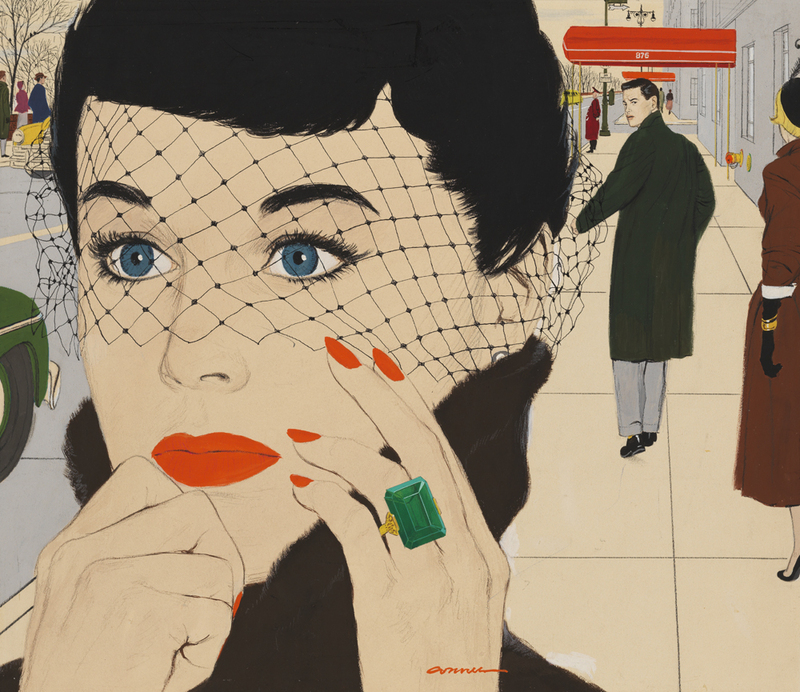 Illustration for “Strictly Respectable” in Redbook, August 1953. Conner’s depictions of women are reflections of what he saw, but they also set the fashion. Guest curator Terry Brown relates that “it was not uncommon for ladies to go in to a hairdresser, hold out an illustration torn out of a magazine, and say ‘I want my hair to look like that!’” Conner’s women carry purses that match their gloves, display painted nails, and wear the latest fashions, like the wasp-waisted dresses that emphasized the female form and celebrated the end of fabric rationing following World War II. Importantly, his representations offered a model to which women could aspire that was also plausibly within their reach. Illustration for “The Good Husband” in Collier’s, February 4, 1955. Gouache and pastel on illustration board. 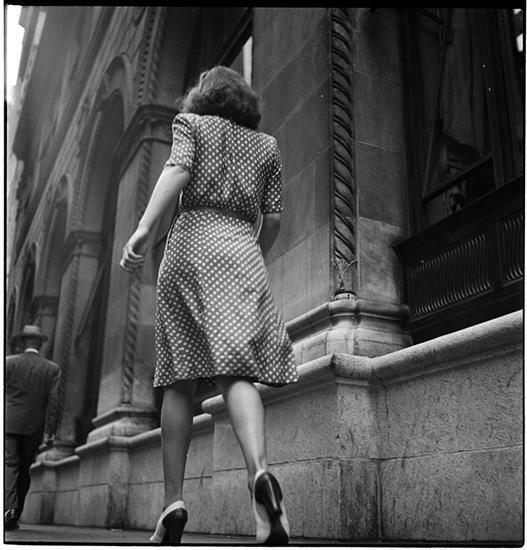 Kubrick’s photographs show stylish women on the street, whose discerning fashion sense informed Conner’s work, as well as ladies who frequented stores in pursuit of this seemingly artless elegance. Conner’s is a version of womanliness that fits within the prescribed gender roles of mid-century society while also allowing women individuality, creativity, and power over their self-presentation—a vision that continues to inspire today. This entry was posted on September 30, 2014 by Sara K. Spink in Uncategorized.